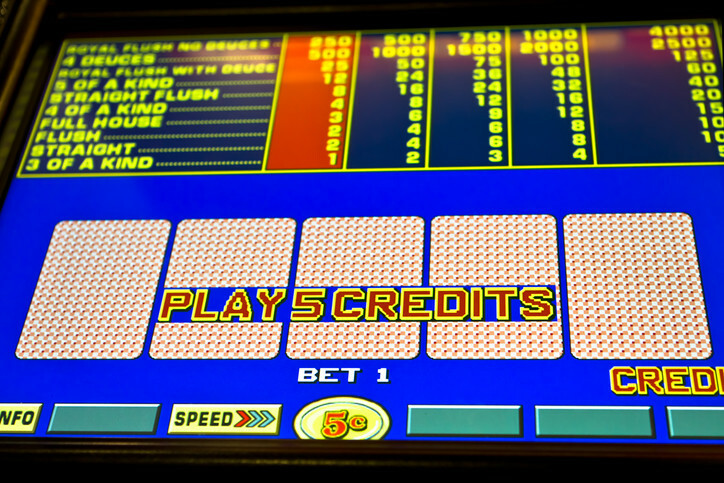 If you’re a video poker fan with a yen for the Jacks or Better (JOB) games you know that hitting four of a kind is the next best thing to a royal flush, but neither happens very often. It’s especially frustrating when you’re dealt three of a kind on the initial deal and there are 47 remaining cards with only 2 chances of drawing that 1 matching fourth card. Initial deal – If you are dealt three of a kind from rank 2 thru 10 and the remaining two cards add up to that particular rank, you will be paid the four of a kind payout for that rank. Example: you are dealt 8,8,8,5,3. In that 5 + 3 = 8, you will be paid for quad eights. After draw – After you discard two non-matching cards and your draw cards add up to that rank. Example: 4,4,4,K,J. Discard the K,J. If a 3,A or 2,2 are drawn, you have quad fours. (Aces count as one). Payouts will vary on winning hands between jurisdictions and casinos. Always check the pay tables for the best value. For more information log on to www.videopoker.com/quickquads where you can download a free guide to Quick Quads by video poker expert Bob Dancer, author of Million Dollar Video Poker. You can view an online tutorial, find out where to play the machines and also play for free on the internet. Additional publications and videos about VP, casino gaming and other products can be found on Amazon. Direct link from this page to purchase.